Hummingbirds are attracted to the color red. And bee balm is red. Red, red. Fire engine red. 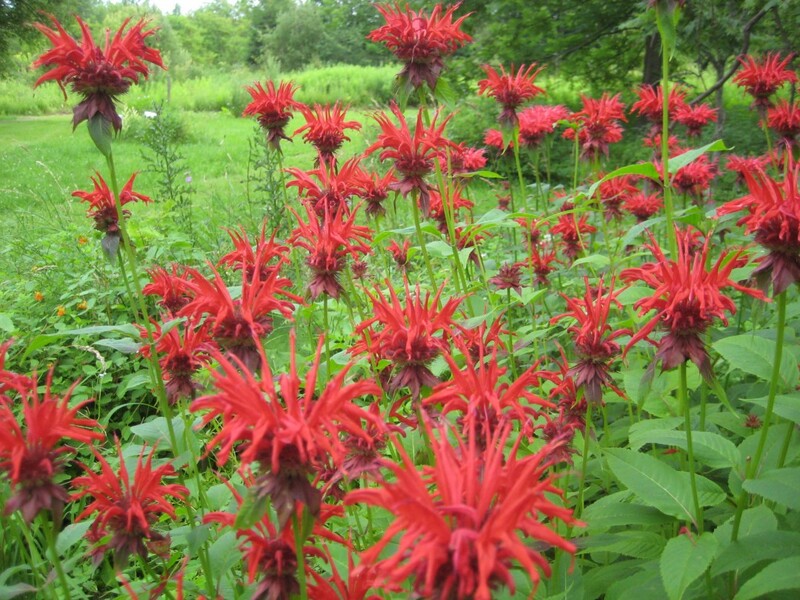 Bee balm is a member of the mint family, as can be seen by its squared-off stems and paired leaves; like most mints, it’s hardy, and spreads readily–pretty easy to grow. My kind of plant. It’s a native wildflower–at least it was originally a wildflower, though I’ve never seen it growing in the wild–what I’ve got in my garden is a nursery-bred variety of the original wild plant. And it’s red. Blood red. Hummingbirds, which have keen color vision, are attracted to the color red. To a hummingbird, waving a red flag is like ringing the dinner bell–it doesn’t make them mad, it makes them hungry. I’ve seen hummingbirds buzzing around a red convertible, checking out red socks on a laundry line, and busily trying to extract nectar from the nozzle of a fire extinguisher. 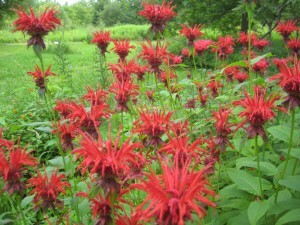 And bee balm is red. Tomato red. In the bird-feeding store, it’s possible to buy hummingbird feeders that are red plastic, with red-dyed sugar water inside. But there are some questions about the impact of a diet of table sugar and red dye on the delicate metabolisms of hummingbirds. Also, if you aren’t diligent about changing the sugar water, it can ferment in hot weather and cause lethal infections for hummingbirds. So, not being the most diligent person, I’ve taken down my feeders so I won’t have to wonder if the sugar is fermenting and I’m doing the hummingbirds more harm than good. Now I plant bee balm. Did I mention that it’s red? Ruby red. British-soldier red. In fact, there’s so much red in my garden just now that in the bright sun it’s a little overwhelming. Like someone wearing way too much red lipstick. 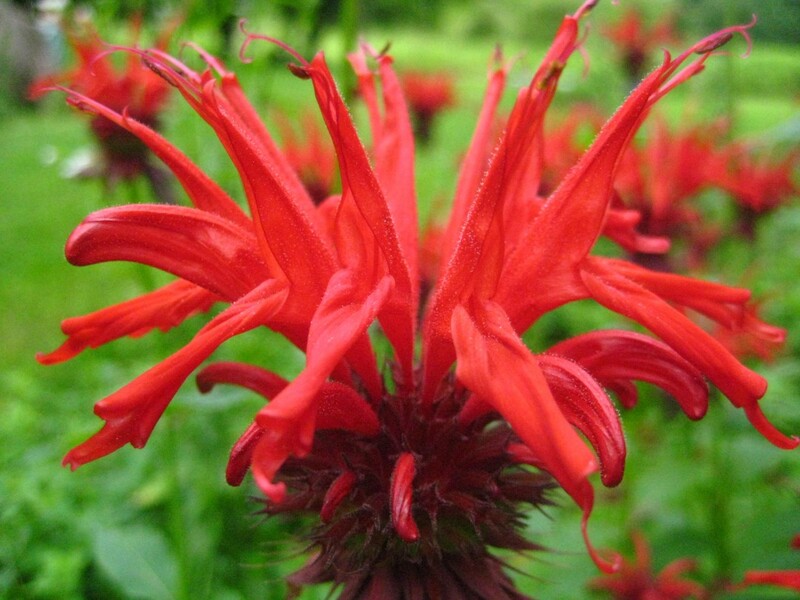 But I like to think that a hummingbird zooming over a my garden could glance down and recognize my bee balm patch as a gigantic red welcome mat. That is fascinating. I just found out today that they are a good companion plant for tomatoes. They act as a tonic that helps with growth of the plant and taste of tomatoes!